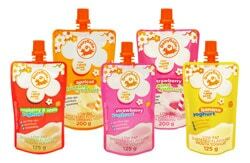 There’s a treat in store for parents looking for something special yet affordable to put in their children’s lunch boxes: new DairyBelle yoghurts in spouted stand-up pouches. There are three variants in two ranges – 125g Smooth Yoghurt and 200g Smooth Drinking Yoghurt. Dairybelle made the move to spouted stand-up pouches for a number of reasons: they’re a healthy snack for people who are on-the-go, they’re affordable and are the epitome of convenience – no spoon required and they’re fully re-sealable. Another selling point is that they create an effective display at the point-of-sale. Made from a PET/PE laminate, the pouches are flexo printed in eight colours, by Nampak Flexible. The screw cap, in Dairybelle’s signature orange colour, is also supplied by Nampak Flexible. The artwork was developed by Johannesburg-based New World Communications. This eye-catching development is the result of a joint project between Dairybelle and Nampak Flexible which has doubled its bag and pouch-making capacity after investing in the latest bag and pouch-making machinery from Karlville in the US. The line at its Ndabeni, Cape Town, factory includes an automatic spout inserter and two multi-format bag and pouch machines that complement the company’s existing Totani pouch-making capability. The Karlville high-speed automatic spout inserter is equipped for 8.5mm tamper-evident screw caps, and can be used on flat, stand-up and quad-seal bags and pouches. Nampak Flexible supplies and services all the necessary fill-through spout technology. Two Karlville high-speed multi-format machines can manufacture 23 different styles of bags and pouches. Additional versatility is provided in the form of in-line die-cutters and re-sealable features, like Velcro press-to-close and zippers. Nampak Flexible can also weld fitments on bags and pouches, and manufacture a bulk liquid pack for the catering industry. “While Dairybelle’s spouted stand-up pouches are perfect for kids’ school lunch boxes, they’re gaining popularity among a wider audience, like sportspeople,” says MacFarlane.